Pretty slow: What are Formula 1's best-looking backmarkers? After qualifying both cars on the penultimate row of the grid for the season-opening grand prix in Australia, it's clear Sauber do not have the quickest car of 2018. But they certainly have one of the most striking. The best-looking F1 cars typically populate the sharp end of the grid - certainly that's generally been the case in the past couple of decades - but go a little further back in history and some of the best paint jobs were to be found scrapping for minor honours. With that in mind, BBC Sport has selected some F1 cars from down the years that failed to earn a single point in the year highlighted, but at least had the upside of being easy on the eye. Take a look at our gallery and then cast your vote for your favourite at the bottom of the page. The Eagle immediately caught the eye on its entry to F1 in 1966 with its sleek design and dark blue livery, and for a time looked destined for great things. The '66 car had decent pace but was unreliable, but a year later was quick enough to start on the front two rows at every race. However, crippling unreliability remained, and Dan Gurney's win in Belgium and third in Canada - while impressive - were scant return. By 1968 a lack of development saw the car fall hopelessly off the pace as Gurney retired from four of just five entries that season. The end came, ignominiously, in Canada, where Al Pease became the first, and so far only, driver to be disqualified from a World Championship race for being too slow. The liberal nature of F1's participation rules back in 1970 meant that McLaren were able to run effectively two teams that season - one powered by the ubiquitous Ford Cosworth DFV, and the other by an Alfa Romeo engine. It is the latter that makes this list after Andrea de Adamich and Nanni Galli failed to haul the McLaren-Alfa into the points in 10 attempts, a sequence that included five failures to qualify. Still, that papaya orange livery was a real treat for the eyes. The British Ensign team, founded by Mo Nunn in the early 1970s, failed to pull up too many trees in 10 seasons in F1, but their cars were typically well turned out challengers. That was certainly the case with 1980's N180, which was piloted by five-time grand prix winner Clay Regazzoni until he suffered a career-ending accident at the United States Grand Prix West at Long Beach. Britain's Tiff Needell - later to find greater fame as a host of the BBC's Top Gear - took over the drive for two races before he was replaced by Dutchman Jan Lammers. A second N180, driven by Briton Geoff Lees, competed in the Dutch and Italian Grands Prix, but a pointless campaign could not be averted. Alfa Romeo are one of the most desirable carmakers in the world, a reputation built in part on their success in the earliest years of the F1 World Championship, when the Italian constructor powered Giuseppe Farina and Juan Manuel Fangio to title wins in 1950 and 1951. Alfa's abrupt withdrawal from the sport before the 1952 season marked the end of their involvement as a manufacturer until 1979, when they returned for a second bite of the cherry. Two poles and a handful of podiums followed over the next five seasons, but it was clear the glory days were long gone. The team's final car, 1985's 185T, looked the part, but was woefully off the pace. "The worst car I ever drove," was one of the kinder things Riccardo Patrese later said about it. When people used to describe Minardi as "perennial backmarkers", they weren't exaggerating. The Italian team based out of Faenza failed to score a world championship point in 10 of the 21 F1 seasons they contested, with their best return in a single campaign just seven points, achieved in both 1993 and 2005. The 1985 M185, driven by Pierluigi Martini, was the team's first car and arguably the best-looking of any they created over the following two decades. It failed to score a point after a punishing debut season featuring 12 retirements and one failure to qualify. Ligier were one of the most competitive teams in F1 in the 1970s and early 1980s, but by 1990 they had been in decline for several years and reached their nadir with consecutive pointless campaigns in 1990 and 1991. The JS33B from 1990 at least had a vivid paint job and a selection of state-owned sponsors to remember it by - gambling and fags, anyone? - but points, alas, were comfortably beyond it. A Renault engine deal briefly revived the team's fortunes but the Ligier name was destined to disappear from F1 at the end of 1996. The once-mighty Brabham team were in their death throes in 1992, but they were at least fated to depart the F1 scene in a measure of style. The two-time constructors' champions - with Eric van de Poele, Giovanna Amati and future world champion Damon Hill on driving duty - qualified for just three races before quietly expiring after the Hungarian GP, but they nevertheless made a mark on the collective memory with an arresting pink-and-purple livery. Like fellow Italian also-rans Minardi, BMS Scuderia Italia spent the vast majority of their F1 existence shackled to the back few rows of the grid - although there were notable highs. A pointless first campaign in 1988 was no surprise, but the team surpassed expectations the following season when Dallara's nimble chassis helped Alex Caffi to fourth in Monaco before Andrea de Cesaris went one better with third in Canada. Another podium for JJ Lehto came at the brutally attritional 1991 San Marino Grand Prix, but the team's days were numbered. The final Scuderia Italia car - 1993's Lola T93/30 - was a vision in red, yellow and white as it bimbled around the grand prix tracks of the world, but competitive it was not. The team sat out the final two races of 1993 as the money ran dry, before a merger with Minardi kept some of the team's component parts alive, if not the name. Simtek burst on to the F1 scene in 1994 with well-intentioned plans of appealing to a new breed of F1 fans with their edgy purple-and-black livery and sponsorship from MTV and Russell Athletic. But the harsh realities of F1 quickly took hold. The death of driver Roland Ratzenberger in a crash in final qualifying for the third race of the season at Imola was a shuddering blow from which the team never truly recovered. David Brabham gamely led the team through to the end of the season while a carousel of pay-drivers occupied the cockpit of the second S941 - an indication of the financial plight that had so swiftly engulfed the team and led to their ultimate demise just five races into the 1995 season. Ok, so we're just one race into the 2018 season and lobbing the new Sauber in with a bunch of cars whose shared trait was a failure to score a single World Championship points is perhaps a tad unfair. However, the lovely C37 was the motivation for this entire article, so in it must go. 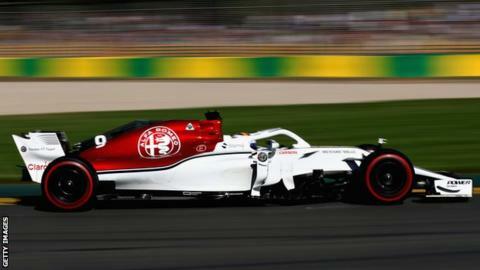 Certainly based on the opening race and the form of recent seasons it's not wholly unfair to predict the Sauber will be cruising at the back this season, but if it starts to drive as good as it looks, maybe the points will begin to flood in. Has McLaren's $100m gamble paid off? Read more on McLaren: 'Red Bull did a better job than us' - has $100m gamble paid off?